As part of Safety Week, The University of New Mexico Police Department hosts an Open House and Meet & Greet with the campus community Friday, Sept. 22 from 10 a.m. – 3 p.m. at UNMPD located at 2500 Campus Blvd. NE. Officers will be available to give tours of the police department, provide public safety and crime prevention tips and demonstrate the Lobo Guardian app. 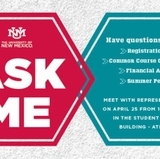 There will also be demonstrations of UNM’s emergency notification system, Lobo Alerts, as well as history on the department. Light refreshments will be served.